Instagram Roundup: Teresa Giudice, Stassi Schroeder, Andy Cohen, Craig Conover, & More! It felt like there were Real Housewives meetups happening all over the country this week. Or at least that’s what it seemed like when I scroll through my Instagram feed. 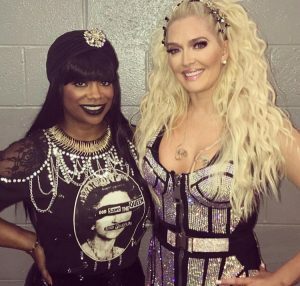 Kandi Burruss supported Beverly Hills Housewife Erika Jayne at her Atlanta concert. Potomac Housewives Gizelle Bryant hung out with Real Housewives of Atlanta OG NeNe Leakes. Warning: they applied way too much airbrush to their IG photo. Cynthia Bailey left the ATL to hang out with Dorinda Medley in New York City. Bravo worlds collided when Vanderpump Rules cast members Stassi Schroeder and Beau Clark spent time with (the remaining) Summer House stars Kyle Cooke, Carl Radke, and Amanda Batula. Real Housewives of Dallas stars Stephanie Hollman and Brandi Redmond shared photos hanging with their kids. Meanwhile, their costar Cary Deuber shared a photo of her face all marked up and ready for a cosmetic procedure. Orange County Housewife Shannon Beador followed her lead. Shannon posted a photo of herself getting some cosmetic enhancements. This is a social media trend that I just don’t understand. RELATED: Instagram Roundup: MJ Javid, Ashley Martson, Ashton Pienaar, & More! Captain Lee Rosbach and Katie Chastain attended an event in Florida with Below Deck alum Connie Arias. Josiah Carter shared a picture of himself Ashton Pienaar, Ross Inia, and Adrian Martin. Meanwhile, the two most controversial cast members (who haven’t been fired yet) Rhylee Gerber and Laura Betancourt took a selfie while kayaking. Southern Charm stars Cameran Eubanks, Craig Conover, Chelsea Meissner, and Whitney Sudler-Smith enjoyed some quality time. Naomie Olindo shared an “after” photo following some Botox injections. Kathryn Dennis slayed in a hot pink outfit at her brother’s wedding. Teen Mom and star of the upcoming Ex on the Beach season Farrah Abraham channeled her inner Ariana Grande (who was inspired by Mean Girls) for a photo. 90 Day Fiance couples Jonathan Rivera and Fernanda Flores, Ashley Martson and Jay Smith, and David Toborowsky and Annie Suwan let us all know that their relationships are still going strong with some photos. Real Housewives of New Jersey cast member Melissa Gorga and her daughter Antonia posed for a photo with Jennifer Lopez. RELATED: Instagram Roundup: Reza Farahan, Lisa Vanderpump, Captain Lee, & More! Check out all of those photos and even more pictures from this week’s Instagram Roundup by clicking through the gallery below. TELL US- WHICH PHOTOS ARE YOUR FAVORITE FROM THIS WEEK’S EDITION OF INSTAGRAM ROUNDUP? WHICH REALITY STARS DO YOU WANT US TO INCLUDE IN OUR NEXT INSTAGRAM ROUNDUP? Now that Khloe Kardashian has confirmed that she is expecting a baby with NBA player Tristan Thompson, she has been showing off her baby bump, and she recently celebrated the milestone at her baby shower. Of course, Khloe’s famous family was in attendance, but there were plenty of other famous faces on hand to celebrate baby Thompson. Happy Friday! Let’s celebrate with an all new roundup of hot reality TV star photos! Former Shahs of Sunset star and current beauty empire mogul Lilly Ghalichi joined Kyle Richards and Faye Resnick as they celebrated the launch of Nicky Hilton’s new bag collection that will be featured at Kyle’s boutique. Sheree Whitfield joined in on an AIDS Walk, along with Chrishena Stanley, star of the new series ‘Selling It in the ATL’ which Sheree is a co-producer on. Jill Zarin attended the Angel Ball with her husband Bobby. Carole Radziwill was seen walking her dog in SoHo. Also in our photo gallery you’ll find: Ryan Serhant, Taylor Armstrong, Sonja Morgan, Kourtney Kardashian and more! Kourtney Kardashian put her recent split from Scott Disick aside to focus on daughter Penelope‘s third birthday on Wednesday. Kim Kardashian, North, and Kris Jenner joined Kourtney and Penelope at Disneyland to celebrate the special day. Kourtney shared the above picture of Penelope, adding, “Happy birthday to the sweetest little girl in the world. Watching your every little move everyday brings me immeasurable happiness. #toomuchfunyesterdaytopost #disneyland” See more photos below. CLICK CONTINUE READING FOR THE PHOTO GALLERY! After the Easter egg hunt was over at the Kardashian-Jenner house, the family dialed up the paparazzi, grabbed their not-so-best white outfits and headed to church in Woodland Hills for an Easter service photo op. Kourtney Kardashian was the only one who didn’t get the all-white wardrobe memo. It looks like the only two members who got out of this media debacle were Scott Disick and Rob Kardashian. Otherwise the gang was all here! Kris Jenner brought along her new man, Corey Gamble and 17-year-old Kylie Jenner brought along her 25-year-old boyfriend Tyga – and his two year old son. Hot Photos: Alexis Bellino, Farrah Abraham, Abby Lee Miller, Dance Moms Cast And More! The reality stars were out and about this week, attending events, running errands, and more. Teen Mom Farrah Abraham ditched MTV for the night and supported Bravo’s Blood, Sweat and Heels at an event celebrating the show’s second season. She was also snapped visiting Planet Hollywood. Abby Lee Miller and the Dance Moms cast headed off to L.A. this weekend, attending the Nickelodeon Kids’ Choice Awards on Saturday night. Abby and the crew were there to accept the award for Favorite Reality Show! We’re not kidding! Also walking the orange carpet at the Kids’ Choice Awards: Draya Michele and Tia Mowry. In the gallery below you’ll also find Alexis and Jim Bellino, Karina Smirnoff, Stassi Schroeder, Kim and Kourtney Kardashian and more!